There are probably more variables and constraints, and the biggest pain point for me was to go through Google Maps every time and plan after looking at the traffic situations, quantify those green, yellow, red and dark red lines and make decisions accordingly, this was too tedious for saving few minutes off the commute. Thus, the idea of commute.py was born. There is already a huge amount of data collected by Google Maps and made available to developers via their APIs. My initial idea was to take my existing routes, use Google Maps to find the travel times and let it tell me the best way to reach work. At first it did work great but it felt like something was amiss. Later, I realized it would be a better approach if I could just provide the intermediate waypoints, the different ways of travelling between those waypoints and let the algorithm figure out which is the best route, this seemed better and clicked really well with what I expected of the system. There could also be a possibility that the system discovered a better route which I didn't think of. 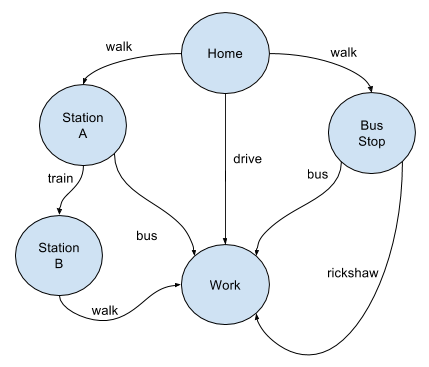 I provide the commute.py a Directed Acyclic Graph consisting of the intermediate waypoints and the different modes of transports which can be used to commute between them. 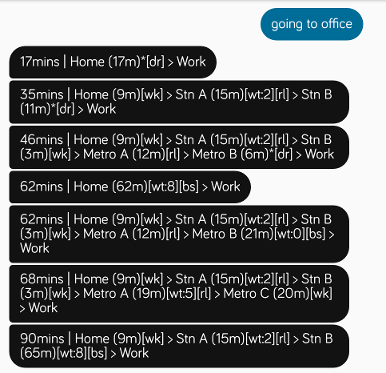 The algorithm takes a source and a destination and computes all the routes, their times and returns the output in ascending order of total commute time, using the data provided by the API. Using the predictive capabilities that Google Maps provides it would make it really easy to see what could be my commute times at some point in the future, or just use the real-time search. 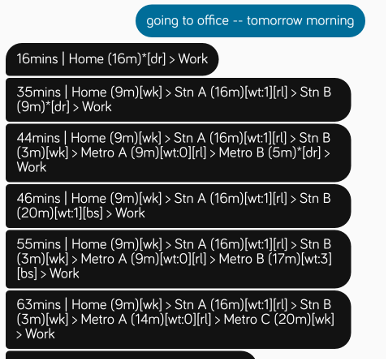 The alpha implementation of commute.py comes with a command line interface. It is not great but gets the job done. It is not a very user-friendly user interface as of now and definitely not something that is always available. I personally use it with a Facebook Messenger bot which makes it very easy without much hassle. The source and more information about how to use commute.py is available on Github and PyPI. I'd love your feedback and thoughts and if it helped you in trying to ease your commute problem. Feel free to send a pull request if you feel you can contribute in anyway.